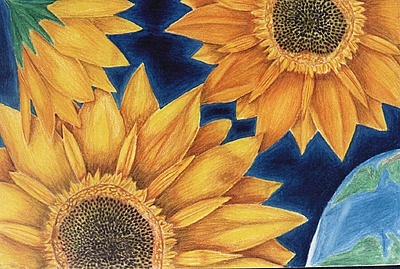 The sunflowers gleam at you, their hands a golden reach and their faces upturned toward the rays. They stand peacefully, whispering delicately as they sway to the breeze, defying the morning heat. They’re simply complex beings that breathe and dream and laugh as the moon cascades light across them deviously. To run through a field of sunflowers. These beings blissfully await, offering all they have at the glance of an eye. Your feet eagerly step toward them but stop in hesitance as you beckon your courage and heart to fall in sync with each other. You begin to run through the sunflowers, blissfully confused by your rush of emotions. The corners of your mouth are pinned against your ears and your nose welcomes the petal perfume that freely floats inside, flashing your mind back to the days of childhood spent with laughter and tears. But at the sound of a crack, everything stops. You look down to realize that below your foot lies a single sunflower, broken and crying. Its stem is bent at a grotesque angle, and you feel your chest rapidly rising and falling. Turning around frantically, you search to find more of your reckless mistakes, only to accidentally create more of them. Your once bouncing feet are now accidental hammers, shattering and crunching sweet life beneath them. This piece was written through a metaphorical lense on what it means to be recklessly happy. If those we love are sunflowers, do we rejoice with them, or watch as their stems break in our own mindless bliss?